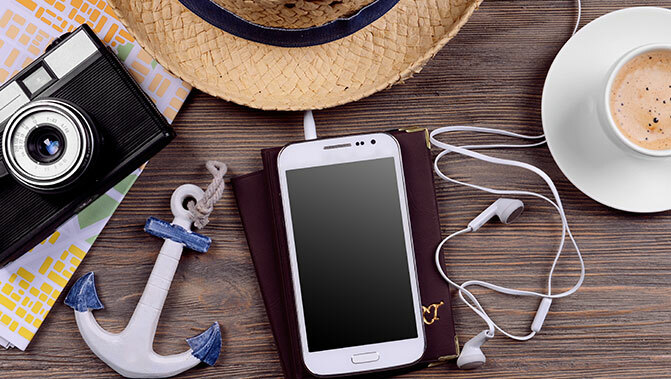 Busan is bordered by rugged mountain ranges and white sandy beaches, making it the ideal holiday destination. 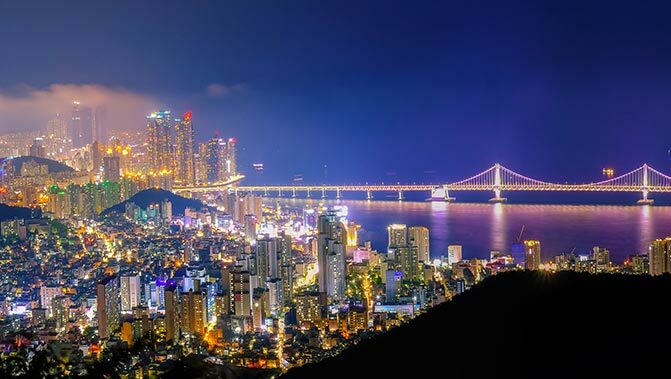 The best views of the entire city, with its pretty pagodas, steaming hot springs and colourful parks, are from the top of the famous, 118-metre-high Busan Tower. Wander the alleyways of the pastel-painted Gamcheon Culture Village, nicknamed the ‘Santorini of Korea’, where you’ll discover quaint cafés, street art and the Busan Modern History Museum exhibiting historical household items. 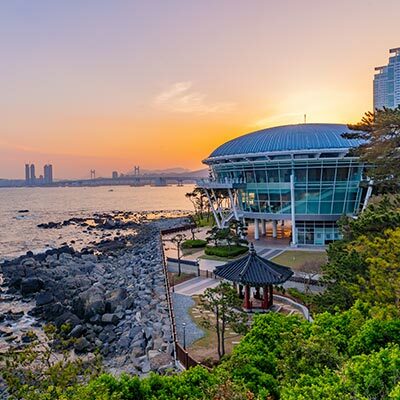 Then head down to nearby Songdo Beach for a dip in the ocean, a stroll along the skywalk or a cable car ride with breathtaking views of the coastline. 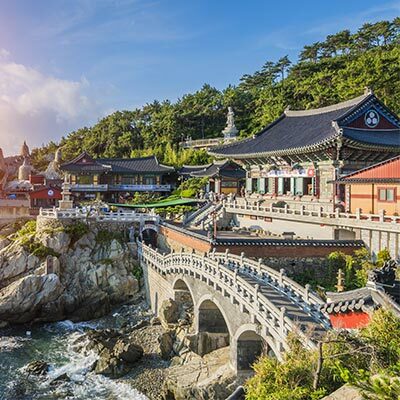 The Haedong Yonggungsa Temple dates back to 1376 and is famous for its unique cliff-side setting and architectural beauty. Hidden in the peaceful grounds, you’ll find a wishing pond and the revered Yacksayeorae Healing Buddha. For souvenirs, go to Nampo-dong, which has alleys of vintage clothes, books and retro tin cans. Make sure to sample the delicious bibim mandu (fried dumplings in a sticky sauce) while you’re there. Don’t leave without a visit to Jagalchi Market, the biggest seafood market in the country. Here, you’ll find an incredible variety of still-swimming sea creatures, including the two local favourites, crabs and eels. The fishmongers will have your choice of seafood caught, prepped and served on your plate in mere minutes – it doesn’t get fresher than that!